Beginning at 0:42 in the Video above, Harry Reid (D - NV) says, "I've a very simple message to John Boehner: Let the House Vote. Stop trying to force a government shutdown." That sentiment is no secret. However careful analysis of Senator Chuck Schumer's (D - NY) body language about one minute later does reveal a less obvious opinion though. Note: The original video has, since the original post, been removed from its online source. The images below however, were captured from this video. 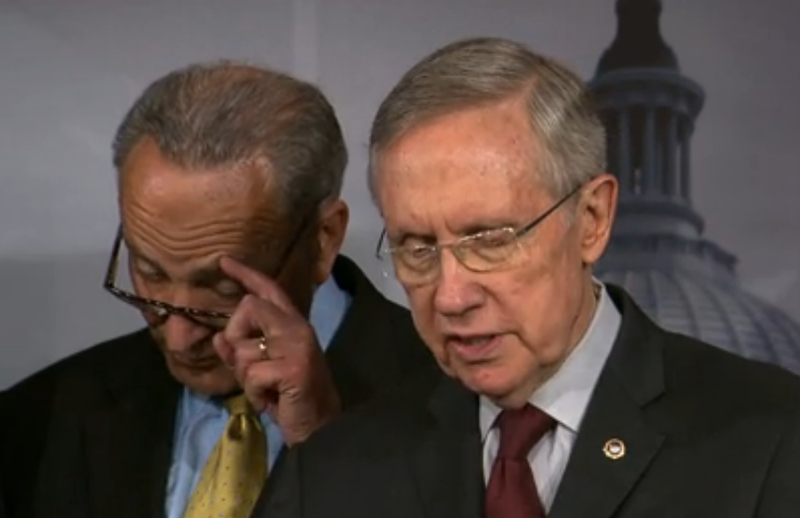 During 1:44 - 1:47 Harry Reid says, "The votes are there to pass a clean CR" (Continuing Resolution). Overlapping with this statement during 1:46 -1:48 Schumer rubs left eyebrow with his left hand (more specifically with his left index finger aka forefinger) as he tilts (flexes) his head and neck down and forward. 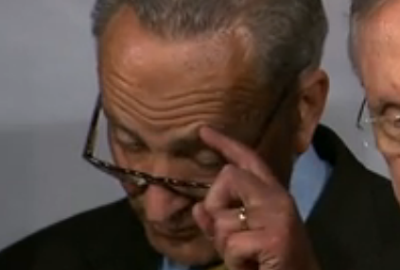 At the same time Senator Schumer contracts and elevates the entire width of his forehead. This action also elevates both of his eyebrows. In addition Schumer closes (or nearly so) both upper eyelids - but not in the usual fashion - rather he creates the dual tension of also trying to open his eyelids at the same time - but with a bit less effort so they are almost entirely closed. This competing dynamic gives the eyelids a particular look - as if they're "put on stretch". This body language cluster of stretched eyelids, the entire forehead contracted, a unilateral eyebrow rub and a forward head-neck tilt given in concert with another person's declarative statement, e.g. Senator Reid's, "The votes are there to pass a clean CR" - is a very strong nonverbal indicator that Chuck Schumer does not believe Harry Reid. This does not necessarily indicate he believes Reid is lying (although in this context, it is the most likely conclusion), but at the very least it indicates that in Schumer's judgment, there are not enough votes. Senator Schumer is a great example of just how unaware people typically are of their nonverbal tells when the attention is upon another individual near them - even when they are being televised. What other very significant body language did he exhibit during this short video?